The Minnesota DOT – TAMP is available here. In accordance with the Moving Ahead for Progress in the 21st Century Act (“MAP-21” – the federal transportation authorization signed into law on July 6, 2012), the Minnesota Department of Transportation (MnDOT) has developed its first ever TAMP. It was a collaborative effort, guided by a TAMP Steering Committee with representation from a wide range of MnDOT offices and districts, as well as from the agency senior leadership. MnDOT also worked closely with the Federal Highway Administration (FHWA), the FHWA Minnesota Division, and regional partners (e.g. Metropolitan Planning Organizations, Regional Development Commissions) to create this plan. 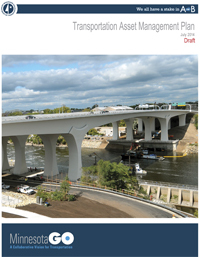 As a national pilot project, MnDOT’s TAMP, along with those produced by Louisiana Department of Transportation and Development and New York State Department of Transportation will serve as an example and guide for other states as they develop TAMPs of their own.